On October 5 of that year Coffeyville found itself in that same position. With aspirations to outdo the famous Jesse James, the members of the Dalton Gang hoped to score big in Coffeyville by robbing both banks at the same time in broad daylight. Instead of giving into the gang&apos;s demands, residents armed themselves and fought back, killing four of the bandits and seriously injuring the fifth. 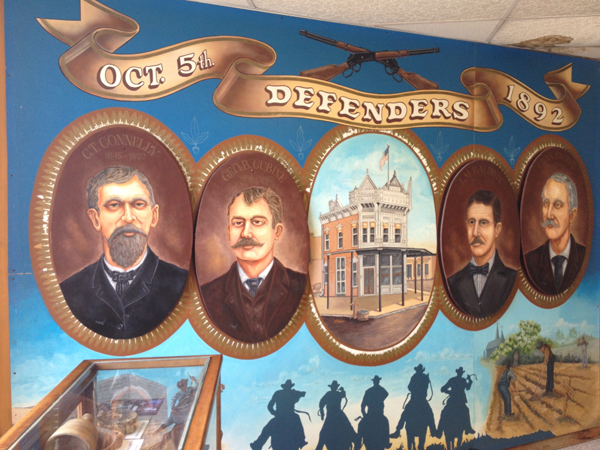 The bravery of the town&apos;s defenders and the four men who gave their lives in the battle are a source of pride throughout Coffeyville, highlighted by the Dalton Defenders Museum in downtown Coffeyville. Located just steps away from the plaza in which the shootout occurred, the museum houses a large collection of items and memorabilia from the attempted robbery, including guns used by the Dalton Gang and a video which explains the raid in fascinating detail. You&apos;ll also discover items from early day Coffeyville and the surrounding area, in addition to mementos of Walter Perry Johnson, a Hall of Fame baseball player who lived in Coffeyville and other items from World War I. Just outside the museum, a kiosk marks the start of Coffeyville&apos;s Historic Walking Tour. The short tour takes you through the heart of the gunfight, passing Isham&apos;s Hardware, the oldest hardware store in Kansas; the Perkins Building, which housed the Condon Bank the day of the robbery; the old jail; and the spots where each of the eight men fell after being shot. It&apos;s interesting to imagine the robbery and gunfight take place as you trace the Dalton Gang&apos;s last steps. You can hear the excitement in the museum volunteers&apos; voices as they describe the town&apos;s history and bits of information about the museum&apos;s collections. Most visitors take anywhere between 10 minutes and two hours to walk through the exhibits, but I would recommend taking the time to appreciate the history of the town and it&apos;s defining moment.